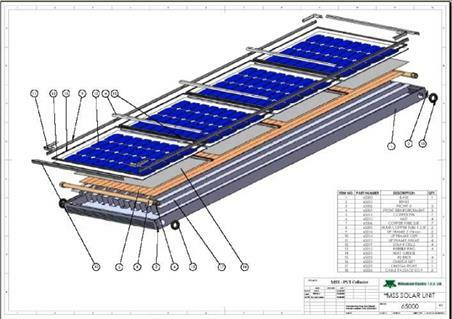 The configuration of the PVT module consists of a row of photovoltaic cells with a rectangular surface area of 1cm x 1m, placed at the top of the aluminium heat sink. The encapsulation can be divided into various elements. 1. — In the surface at which concentrated radiation is received, an EVA film is applied to the cells, and high absorption glass with low iron content is used as an outer skin. This reduces deterioration of the cells and minimises the thermal losses through the top of the module. 2. — Between the cell and the heat sink a strip of electrical insulation is inserted using a double sided adhesion (Chomerics Thermattach T404). This method considerably-simplifies the adhesion process, as it simultaneously serves to insulate the cell and to fix it in right position. 3. — Finally, the lateral and underneath faces of the heat sink are thermally insulated-with a plate of temperature resistant polypropylene. The figure 2 shows a scheme of the proposed cooling system. Concerning to the boundary conditions they must be fixed in the numerical study. In the outer upper face of the cooling device a, Neumann boundary condition of 1000W/ m2 is applied. This represents the heat flow per unit surface area that the cells transmit to their back contact. The remaining lateral boundaries are considered to be adiabatic surfaces, assuming that the insulation is sufficiently wide to achieve this requirement. Finally, at the surfaces that represent the entry and exit of the fluid flow, the boundary conditions are fixed flow at the entrance and free flow at the exit. As a line of symmetry exists in the geometry (Fig.1) only half of the system will be modelled. The tube is made of aluminium (thermal conductivity k =202W/mK). The analysed cross sections are those of the usual commercial tubes with rectangular cross section. The only requirement is a fixed section at the upper face where to accommodate the row of PV cells (1cm width). In the table 1, a summary of the analysed sections is shown. The difference among these three sections relates to the height of the section, it varies from 7 to 27 and hence the aspect ratio increases. A lot of effort has gone into reducing the costs of solar cells by bypassing the ingot/wafering process, which is currently the dominant industrial process. Early on it was realised that such a wasteful process could be avoided by the direct preparation of silicon sheet by ribbon growth techniques . The SDS-Silicon on Dust Substrate process, described here, is a new method for the growth of silicon ribbons for photovoltaic applications. 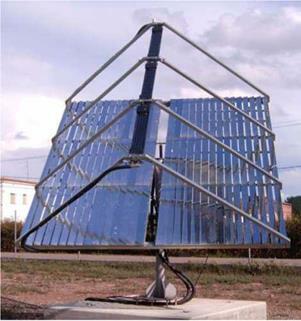 The system developed at the University of Lleida (Figure 1) is a two-axis sun tracking system using water as a working fluid. The absorber has 72 mono-crystalline Si solar cells which are adhered on top of two circular tubes. Water runs in these tubes to cool down the cells thus enhancing their efficiency and the outlet water is guided to a storage tank where it can be further utilized for domestic hot water production or running a solar-driven chiller. The 12 m2 reflecting system (receiver) is composed of 30 white mirrors that reflect light onto the PV focus band of 0.10 m width and 3.90 m long. The mirrors are of equal length but have unequal widths and are installed at various tilt angles. The solar cells are illuminated by approximately 22 times the solar beam irradiance. The generator’s rated power is 1 KWectrcial and 4 KWthermal. The different operation strategies for the cogeneration plants influence the power quality in the grid. To evaluate the power quality we used a load flow analysis . For that analysis it is assumed that all load and generation are 3 phase symmetric. So the result will be the same for all phases. The grid is represented by the admittance matrix, which contains all elements of the used equivalent circuits. The algorithm for solving the load flow equations is implemented in the open source language R (www. r — project. org). To evaluate the power quality a load flow analysis for the low voltage grid described above was made. For the analysis it was assumed that the electricity demand is distributed equally to the 4 houses. Also the 4 PV plants have the same generation schedule. The feed-in of the CHP was defined by the optimisation results described above. As slack node the node GRID (Fig. 1) was set. At this node the voltage is fixed the reference voltage of 395 V. This is less than the nominal voltage of 400 V to increase the input of decentralised generation in the grid. The slack node also must absorb/provide the needed/surplus power. The load flow analysis was repeated for each time step. produced energy is at 10 am where the transport capacity is restricted due to high PV input. In “LOCAL” scenario the high price times are in the early morning and evening. So the CHP operation blocks are shifted to these times. Because of this shifting all the produced energy of the CHP can be used in the local grid and no further violations are caused. 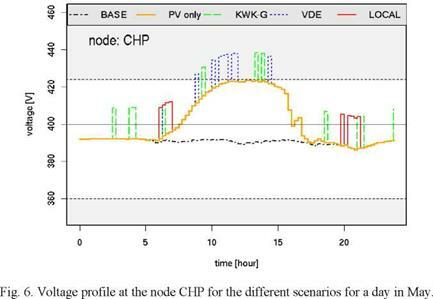 The maximum voltage does not exceed the maximal voltage in the “PV only” scenario. As it can be seen in the results of Fig. 6 the locally optimised CHP operation with a local price curve can help to control decentralised generation with respect to restrictions from the grid. In the scheduling process of generation it must be avoided, that all generators feed in simultaneously if there is little load and the grid is near its transport capacity. Because almost all plants do have local conditions to be fulfilled (e. g. heat restriction for CHP plants) it seems not to be possible to control all of them by a central device. These restrictions only can be known by the local operator. With the local price curve he also will automatically act according to the grid operator’s interests as much as he can. Within this paper we demonstrate the potential of local management of decentralised generation to increase grid capacity towards RES and DER, taking cogeneration as example. For times of high grid utilization due to local excess energy production, lower pay-back prices for controllable electricity feed-in are defined by the local grid operator, while during times of low grid load prices are increased accordingly. This local component to the price curve for produced electricity stimulates local operators to shift their generation to high-price times. With this control method the grid operator can influence operation without direct access to cogeneration devices and the amount of RES can be increased without upsizing the grid facilities. This method can easily be extended to loads, which will be influenced by flexible tariffs. With the propagation of “Smart Metering” systems, the option of tariff driven loads and generation will be available in the near future. The present work reports the main issues of coupling solar collectors and cogeneration units for heating and cooling purposes which have been derived from the detailed analysis of a study case. The work suggests a procedure for planning such systems so that solar collectors and a cogenerator do not interfere in their respective operation. The procedure includes the selection of a layout, the definition of a control strategy and the sizing of each component of such a plant. The outputs of the procedure are used in TRNSYS dynamic simulations to assess the performance of the planned plant. In Solar Heating and Cooling (SHC) plants, solar collectors are typically assisted by auxiliary technologies to match the entire user’s heat demand. Gas boilers are commonly employed as heat back up systems, but further machines fit to the same use. Among the possible supplementary technologies, Combined Heat and Power (CHP) generators, also known as Cogeneration systems, offer some advantages. Many technologies are available for cogeneration but in this work only gas engine based CHP units are considered in combination with solar collectors, both for heating and cooling purposes. The latter is supposed to be achieved by means of an absorption chiller. When heat recovered from a CHP system is used to power an absorption machine, this not only meets the cooling load, but also reduces the peak electric demand caused by the cooling request . Moreover, a balanced heat demand over the year, due to the presence of an absorption chiller, improves cogeneration application project economics by increasing its operating hours per year . When CHP units are selected to assist solar collectors for heating and cooling purposes, further advantages are added to the above mentioned ones. In fact, CHP systems support solar collectors by providing a heat source which derives from thermal recovery. Hence, such a back up results in a more efficient energy supply and fuel saving compared to conventional systems (e. g. boilers), especially in cooling season as heat driven chillers require heat amounts larger then the electric demand of conventional chillers. equipment is to cool the engine ), with the aim of meeting the heat demand, both in winter and summer. As planning such systems can be rather complex, a research work is being carried out to identify the main criteria for optimal designing and sizing. This work is based on dynamic simulations on TRNSYS platform to test on one hand first selected layout and control strategy, on the other hand the influence of various choices of sizes. Knowing that the beam fraction of the global irradiation increases when we move closer to the equator, conclusions can be taken on Solar8 electrical/thermal output ratio depending on its location (Table 5). Table 5. Solar8 electric and thermal annual outputs per square meter of total glazed area, on a N-S tracking axis and 50°C average working temperature. The total glazed are on Solar8 is 4.6m2. The ratio between electric and thermal outputs decreases when Solar8 is moved closer to the equator where the beam irradiation values are higher. The electric output is proportional to the irradiation thus, a PV module as constant efficiency for the same working temperature. A solar collector as higher efficiencies for higher irradiances since the thermal output increases more than proportional when the irradiation increases. There are many ways and factors to take in account when comparing the performance of a concentrating hybrid with a traditional side-by-side system composed by a PV module and a solar collector working separately. The following tables feature Solar8 comparison with the traditional side — by-side system based on their power outputs and total glazed area (Table 6 to Table 8). Table 6. Solar8 electric and thermal outputs with a N-S tracking axis at 50°C average working temperature. Table 8. Traditional side-by-side-system and Solar8 comparison based on total glazed area. The traditional side-by-side system uses less area than Solar8 for the same electric and thermal outputs. This difference decreases when the systems are moved closer to the equator since Solar8 is exposed to higher beam irradiation values. In Lisbon, for instance, Solar8 can be replaced by 1.4m2 of PV module and 2m2 of thermal collector for the same outputs. Hence, it would use 74% of Solar8 total glazed area (4.6m2). Practically, two components require more space than one component. Millennium Electric T. O.U. Ltd.
A new innovation technology includes construction of a Multi Solar Power Station using the Multi Solar (PV/T) Collectors System and a thermal (steam turbine) generator, using the excessive solar thermal energy produced by the Multi Solar System (MSS) which doubles the amount of electricity produced by the PVT Power Station while reducing the costs of the solar electricity produced to as low as under $3 USD per watt in certain countries. The scientific basic principal of the MSS Co-Generation System is A built-in MSS that has the highest efficiency existing today — 85% (15% electricity, 35% hot water, 35% hot air or total 70% thermal energy). Each square meter of the MSS produces 150W DC electricity from PV panels (with 30% higher efficiency than the usual PV due to the cooling system of the PV) and a total of 700W thermal energy. This mass of thermal energy could be transferred into electrical energy with 25% efficiency by using a thermal turbine based on a low pressure steam generator. The MSS PV/T/A technology is the basic element of the Solar PV/T Power Station. 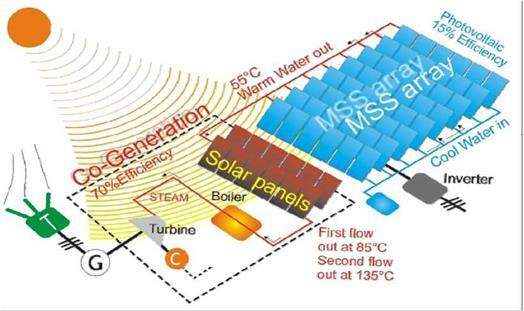 The MSS is an innovative, patented (NO 5522944) Solar PV/Thermal/Air System that makes it possible to convert solar energy into thermal energy and electric energy at the same time using a single integrated collector. The Thermal Steam Generator (Turbine) is the complementary unit to the MSS collector. it makes use of the thermal energy produced by the MSS collector in order to provide an additional and equal amount of energy as is produced by the photovoltaic system. Millennium proposes to establish a solar power station in an alternative structure, operated by 150°C steam generation and thermal turbine. The existing commercial steam turbines can reach 25% optimal efficiency by using solar thermal energy made by the MSS collectors. This decrease of the feeding temperature for the steam turbine leads to dramatic improvement of the economic feasibility, as a result of the smaller solar array required to provide the same output. This innovative technology should improve the ability of countries to increase solar energy production. The progress of solar technologies, the comeback of renewable energies and the development of the MSS collector which produces electricity from PV cells with 30% higher efficiency (by cooling of the PV cells using internal water pipes on the back side of the MSS collector and preventing the efficiency degradation of regular PV caused by excessive heat). The MSS is the appropriate technology for this innovative idea since it’s the only mature Solar PV/T technology which has been in operation for many years. The MSS PV/T/A technology which has been developed in Israel has been integrated in a variety of projects for over 16 years. The MSS has proven technology for commercial applications. Since the proposed solar thermal technology is limited to an operation heat of 150°C, we are limiting the solar steam temperature to a maximum of 135°C, which is the feeding temperature of the thermal turbine. Our innovative idea is to increase the heat of the steam produced by the solar station, while reaching the optimal temperature for the thermal turbine. The system consumes the solar thermal energy produced by the MSS collectors at 55°C at first level. 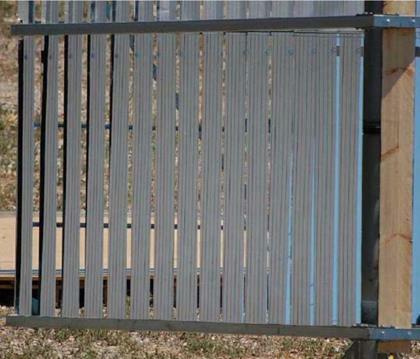 This temperature is being increased by the special solar thermal collectors, connected in 2 rows and transferred to the thermal turbine in temperatures of up to 150°C (steam). The thermal turbine produces electricity based on the thermal energy of 20-25% efficiency. In order to increase efficiency percents, the option to use tracking devices for the MSS collectors may be considered. Where p is the fluid density, Vm is the mean fluid velocity, D is the hydraulic diameter and (x2-x1) is the pipe length. Ignoring the effect of temperature on the cell performance, the efficiency of the electrical conversion of the cells is 20%. 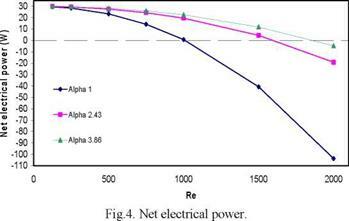 Therefore, for the cell surface area under investigation (0.01m2) and with an irradiation of 15000 W/m2, the electrical power produced by the cells is predicted to be 30 W.
In the figure 4, it can be noticed that the maximum net electrical efficiency has a quadratic form, and increases with growing aspect ratio. On the other hand, the slope of the parabola in the region which describes the power in the laminar regime is much greater in tubes with smaller aspect ratio. In the SDS process (see flow diagram in Fig. 1) a bed of silicon dust, obtained from high purity gaseous feedstock, is prepared, acting both as a cheap substrate and as a “sacrificial detachment layer”. A thick film is then deposited on this bedding layer by fast CVD, at low temperature and atmospheric pressure. Finally, the detached free standing ribbon is recrystallised by a floating molten zone (ZMR — Zone Melting Recrystallization) technique. The advantages of the SDS process are: (i) no substrate and therefore no associated cost and no contamination; (ii) low energy and thermal budget by use of atmospheric pressures and low temperature CVD; (iii) high quality, free standing, crystalline silicon sheet by float zone crystallisation, with no contact with foreign materials. The SDS process is well suited for operation in a continuous mode. For example, at a 20 pm/min deposition rate (achievable with silane at ~900°C), 10 minutes are required to achieve a 200 pm thick pre-ribbon. This deposition rate is such that, during the recrystallization step, with a constant advance speed of 10mm/min, only a 100 mm long high temperature (900°C) zone is required. Fig. 1. SDS process flowchart. The PV modules have been replaced by a wooden target that has identical dimensions. The target was painted white for better contrast in the pictures. On that target a set of parallel lines in different colours are drawn accurately with a 2 cm difference between each of them. These lines are used as reference edges in the target from which the irregularities of the reflected pattern (Figure 2) can be observed. A set of pictures were taken with a digital camera placed at a distance perpendicular to the concentrator’s axis which is oriented towards it. A movable platform was used to insure the correct location of the camera along the normal to the concentrator. The principle of the two-point perspective is used to detect, with the aid of numerical software, the edges of the target. of the normal vectors for each mirror is further constructed and the RMSE calculated. The above procedures were made for a vertical and tilted concentrator positions. From simple geometrical relations it can be proved that the values of angles a and a are related to real tilt angle qexp which is computed as per equation (4). 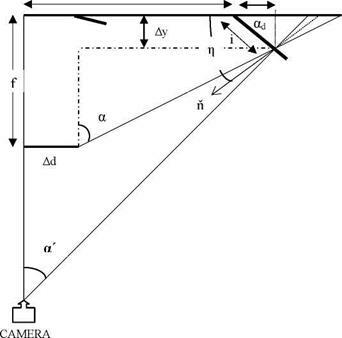 Irregularities in the mirror’s surface affect the tilt angle of the normal vector n. Errors are computed from the discrepancies between the theoretical and experimental values of q. The algorithm requires the knowledge of the image coordinates of the reference line i or more precisely the length Xm in space dimensions. The image coordinates of points along the reference lines are first located in pixels and then transformed into actual distances as shown in the following section. The straight reference lines will appear deformed if the surface underneath is not totally flat.